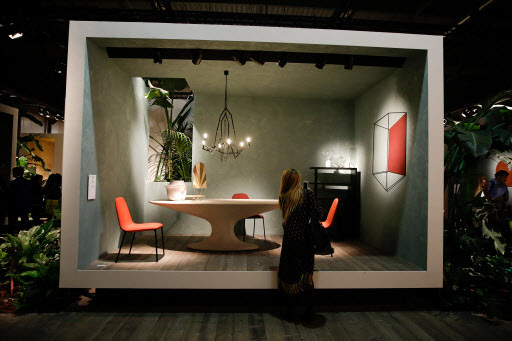 MILAN (AP) -- Big Italian furniture brands turned out collections at the 55th Milan Furniture Fair that included forgotten or neglected treasures from their archives, along with fresh innovations by the “starchitects” who have infused design with glamour. A record 372,000 people attended the premier event for Italian design and furnishings that ended Sunday. It featured more than 2,400 exhibitors at the Rho fairgrounds and spilled out into eight design districts in Milan’s city center. The annual gathering highlights the prowess of Italy's furniture manufacturing sector, which last year reported a 3 percent increase of revenues to nearly 25 billion euros ($28 billion). Patricia Urquiola, who was named Cassina’s new art director in September, is doing it all: launching her own designs while curating new works from colleagues, and updating the Italian brand's iconic pieces ahead of its 90th anniversary next year. She started with a new armchair called “Gender,” which she described as her “manifesto piece.” It combines two elements: a ridged, high-back form that embraces the occupant with a more cartilaginous, adjustable headrest and a fitted cushioned “dress.” The chair can be paired with an inverted U-shaped ottoman. “I think it is time to stop the argument of gender. We need more blended gender,” she said. For her debut collection, Urquiola also revisited a steel-supported table designed by Carlo Scarpa in 1968, making it from anodized aluminum in strong shades including copper and matte red to lighten the impact. 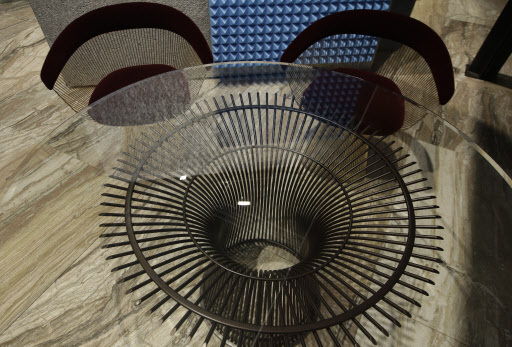 The table in the central Milan showroom featured a clear glass top, but it's also available in white or black marble. The energetic Spaniard’s works also popped up at collateral design events, including a stained-glass credenza, cabinet and room divider trio commissioned by Spazio Pontaccio. Taiwan-based architect Shi-Chieh Lu adapted the traditional yoke-back Ming chair popular in China for Poltrona Frau, as the Italian brand infuses its collection with a taste of the Orient. While the Ming chair has traditionally been crafted from wood, the “Ming’s Heart” design for Poltrona Frau takes its European cues from the leather styling. The distinctive geometric back and seat are suspended from the tubular frame, creating the sensation of a swing. “It gives the idea of floating in the air,” Shi-Chieh said. The Ming chair is among a series of pieces commissioned by Asian designers this year that merge with Poltrona Frau’s iconic pieces and contemporary design. Leave it to Knoll to provide the essential chair update. The U.S. brand has made some of the world’s most distinctive, enduring chair designs, including Ludwig Mies van der Rohe's Barcelona chair. “The chair is an intricate question,” allowed Benjamin Pardo, Knoll's design director, recalling the 70 series executive seating collection that marked the brand’s entry into the European market in the mid-20th century. 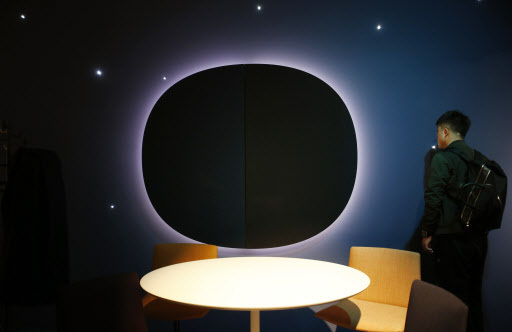 Knoll's latest entry to the world of side dining seating, designed by Marc Krusin, arches comfortably around the occupant and features a functional horizontal aperture between the seat and the back that is both appealing to the eye and allows for easing lifting. Keeping the focus on seating, Piero Lissoni designed a new rail-based sofa system, a trend in the sector, allowing combinations of softer seating with tables on the same base. Dubbed “Avio,” the Knoll system evokes a sense of floating, and has the interior-design advantage of being neither left- or right-handed. “It is intended to be a sofa that one can sit up and have a great conversation in, and also take a really great nap in,” Pardo said. One of architect Zaha Hadid’s last design projects before her sudden death last month was a striking, curved, crystal statement piece for the Austrian crystal maker Swarovski. Titled “Crista,” the massive crystal and metallic flutes splay out of a central point like arching reeds, utilizing for the first time Swarovski’s new wave cut technology. The work anchored Swarovski's debut home collection, which also featured a collection of brightly reflecting trays, centerpieces and bowls by Spaniard Tomas Alonso, and candle holders with refracting crystal wax catchers by Kim Thome of Norway. Hadid’s creativity lived on elsewhere at the Milan design fair, with a prototype cubed low-back armchair for Cassina and curving, black granite wall shelves for Italian brand Citco. As with his runway designs, Tomas Maier took inspiration from materials for Bottega Veneta's latest home collection, with heroic bronze accents. The bronze base of round, arched coffee tables provided a fitting thematic counterpoint to frescoes of fierce war scenes in the living room of the brand’s 18th century palazzo showroom. They were harmonized with velvet seating. Bottega Veneta launched its home line in 2006, and as with other design houses, it is a growing part of the portfolio. This year's collection featured updates on tableware, including porcelain dishes and flatware imprinted with Bottega’s distinguishing weave pattern. Maier also finds crossovers from his ready-to-wear looks. A leopard pattern on a chair appeared on the runway last season, while platinum boxes with semiprecious stones were inspired by Bottega Veneta's stone-inlaid sterling silver jewelry.